The future for natural gas commodity investing looks bright. 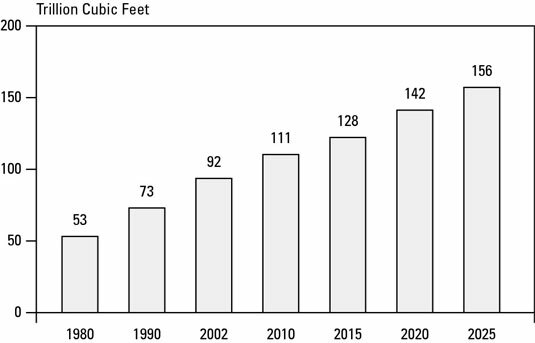 The total natural gas consumption on a global scale in 2005 was approximately 100 trillion cubic feet (100 Tcf). In 2010, that figure increased to 120 Tcf. By 2020, that figure is estimated to increase by more than 50 percent, to a total of 156 Tcf. Knowing that demand for natural gas will remain steady until 2025 is an important piece of information for you as an investor. Perhaps even more important is figuring out which countries and companies will be meeting this demand. Determining who’s going to be supplying this natural gas will help you devise an investment strategy to profit from this increased natural gas demand. Global natural gas reserves are estimated at 6,040 Tcf, which is the equivalent of approximately 6 quadrillion cubic feet (quadrillion, not zillion, is the next figure above trillion). You can get exposure to this huge natural gas market in a couple ways: by trading futures contracts or by investing in companies that are involved in the production and development of natural gas fields.